Hello. 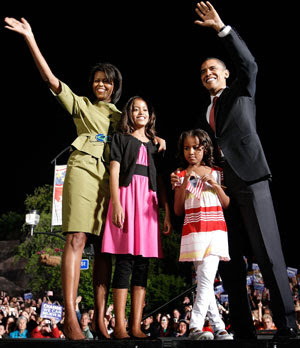 Classrooms across the country on January 20th will be focused on the inauguration of our next president - Barack Obama. Today I would like to share just a couple of resources that you can use in your classroom with your students. There are many, many sites to help you teach the inauguration, those listed below are just a few. 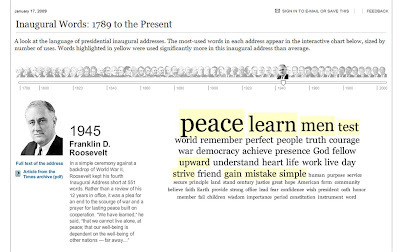 The New York Times has created a rich and interactive site to provide perspective on the inaugural speeches of every president in United States history - see the full text of each speech, a PDF of the New York Times the following day and a word cloud which demonstrates the number of times each word was used. 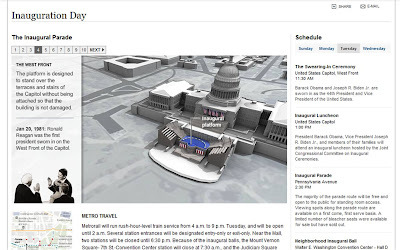 The Times also has an excellent interactive page showing the route Mr. Obama will take during the day, ala Google Earth style. 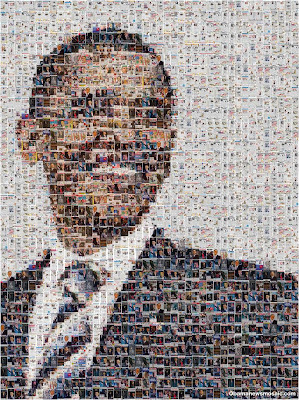 The third site is a link to a cool visual Obama mosaic created from the front pages of over 600 newspapers from the day after the election in November. If you have any comments about the podcast or would like to share what your classroom did on Inauguration Day please leave a comment on this blog post. Hello. As we near the 200th birthday of Abraham Lincoln, I am discussing 10 great things you can do to celebrate the life of this amazing president. I started last week with a great lesson plan and online webinar resource from the Smithsonian ( check out Speaking of History Podcast #166 ). Today I am suggesting a great book I purchased just a couple of weeks ago - Abraham Lincoln : Great American Historians On Our Sixteenth President edited by Brian Lamb and Susan Swain. This is a C-Span book so you know it high quality content and a great way to reflect on a wide range of topics relating to Lincoln. Check out the podcast and listen to what I think of the book. In addition to reading the book, I encourage you to check out the online content from C-Span on Lincoln as we celebrate throughout 2009. 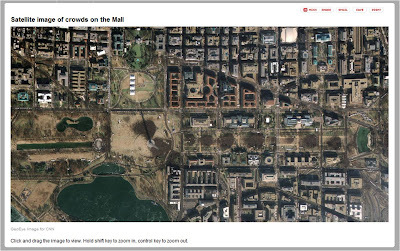 The C-Span site has many additional resources and amazing full length video content with authors and historians on Lincoln. You can view hours of discussion on Lincoln for free from this site - incredible. Just listened to your podcast about our Abraham Lincoln book...thanks so much for telling other teachers about the book. We're all about education at C-SPAN and an endorsement from Missouri's teacher of the year is about as exciting as it gets. Thanks again to Susan and everyone at C-Span for their work in creating resources teachers can use in the classroom. This spring while in Washington DC as part of the National Teacher of the Year Program I spent an amazing day at the Smithsonian learning about the wealth of resources available to teachers - both when physically visiting the museums and when your classroom is hundreds of miles away. 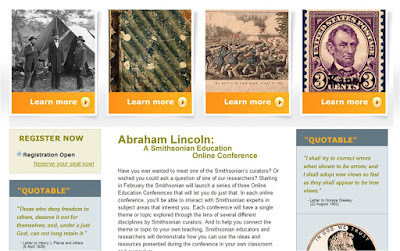 I became part of the Smithsonian Teacher Ambassador Program to help spread the word about these amazing resources. Many of us are currently getting ready to help celebrate the 200th birthday of Abraham Lincoln with our students. 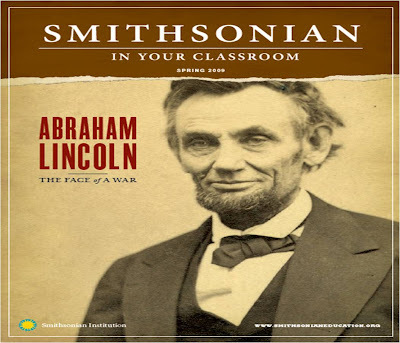 I would like to pass along the following information about the latest issue of "Smithsonian in Your Classroom" - which includes a variety of great lesson plans on Lincoln. The issue includes some great information and one of my favorite Lincoln classroom activities - comparing photographs of Lincoln as he took office and then at the end of the Civil War just prior to his assassination. I encourage all history teachers to check it out. The issue and resources are available online, and as always - FREE. The latest issue of Smithsonian in Your Classroom is on its way to your schools and also available as a PDF download from SmithsonianEducation.org. The lessons in this issue use Smithsonian portraits of Lincoln to introduce a study of the Civil War. 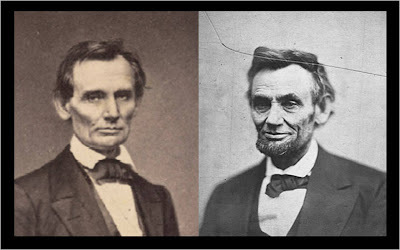 The portraits include the famous “cracked-plate” photograph, two plaster “life masks,” and an eyewitness drawing of Lincoln’s arrival in the enemy capital of Richmond, Virginia. 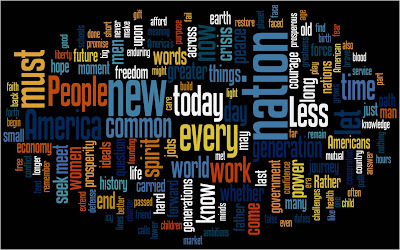 The Smithsonian is honoring Abraham Lincoln’s bicentennial with special exhibitions and programs, and you will be able to participate in the national celebration through the first Smithsonian Online Education Conference: Abraham Lincoln. Throughout the days of February 4 and 5, 2009, you’ll explore Smithsonian research and collections related to Lincoln’s life – everything from portraits and diaries to documents and historical artifacts. Alongside Smithsonian curators, you’ll look at Lincoln’s life and legacy from the perspectives of history, science, and art. Hello. Each year I come to school on one day dressed as a member of the Corps of Discovery. About 7 years ago I received a grant to purchase an outfit based on the records of what a member of the Corps of Discovery wore on the Lewis and Clark Expedition. In the past I have dyed my hair red and tried to become William Clark. Today I just came as a "common" member of the Corps. Hello. We did an interesting activity in class today that I thought I would share - a Book Blitz. Our library media center has a great collection of historical novels and books with a historical interest - my task is to encourage students to check them out and read them. For some reason though it just doesn't work for me to tell them to "go to the LMC and find a good historical novel" so I decided to bring the books to them. The podcast describes how we did the activity and the handout I created is available here as a PDF if you want to use in your classroom. I have also listed a partial list of novels and books that were pulled from the LMC to use for the blitz activity. I have read some, but not all, of the books on this list. If you would like to comment on this podcast, let me know how this activity worked in your class or would like to comment on a novel from the list (or add a historical novel for junior high students to the list) please leave a comment to this blog post. Today's podcast is a review of one the best best I have read recently on the American Revolutionary War era and its leaders - Henry Knox - Visionary General of the American Revolution by Mark Puls For the past couple of year Knox has fascinated me as one of the most under appreciated figures of the American Revolution. His contributions during the war and in the years immediately following the war are incredible - and most Americans are not aware of his contributions. I strongly recommend this book to anyone who enjoys learning more about the Revolutionary era and teaches this time period to students. My wife gave me this book for my birthday in the fall and I really enjoyed reading it. I would love to have the opportunity to sit down and chat with Mr. Knox and I think I would instantly like him. If you have a comment about his book, have read it and would like to share your impressions or share my admiration for Knox -please leave a comment to this blog post. Thanks. Just passing along some information about a great opportunity to Kansas City area history teachers - or anyone that can make it the Truman Library on February 7, 2009. I plan on sending in my application later today. Beginning on February 7th and lasting through August 30th the Harry S. Truman Library and Museum will host the National Archives traveling exhibit, "School House to White House: The Education of Presidents". Journey back to the schooldays of the 20th-century presidents through photographs, archival materials, and museum objects revealing fascinating detail about the children who would one day grow up to be President of the United States. In conjunction with this exhibit, a teacher workshop will be held from 9:00 - 3:00 on Saturday, February 7th. Educators from four Presidential Libraries (Hoover, Truman, Eisenhower, and Clinton) will share information and teaching activities for use in the classroom. The cost for this one day workshop is $25.00 and includes a lunch. The workshop is limited to 50 participants. 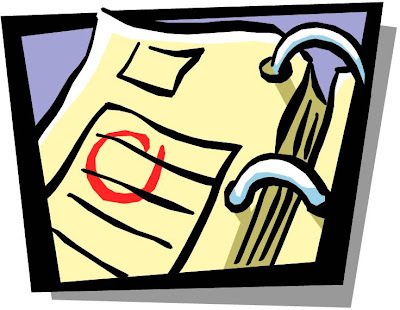 You must go to this Truman Library website education page to download and print the registration. This form with your $25.00 payment must then be mailed in. Hello. Just wanted to let you know I will be hosting a free Microsoft Tech Tuesday webinar describing how we have been using Zune MP3 players in our classroom at 3:00 PM on Tuesday, January 6,2009. Follow this link to register for the webinar and learn more. I have been piloting the use of the Zune MP3 player in my classroom for the past two years. In one of my 8th grade American history classes each student has a 4GB Zune MP3 player. I use it to give them StudyCasts, history related podcasts, video and copies of the presentation notes. It has been an exciting project and my students love it. The webinar will be an opportunity for me to describe the project in more depth. 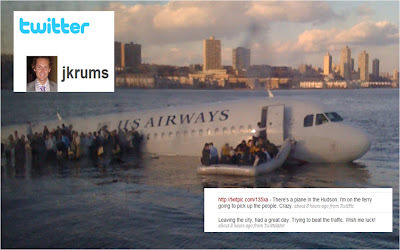 This webinar is also scheduled to repeat on March 10, 2009 if you can't make it on Tuesday. 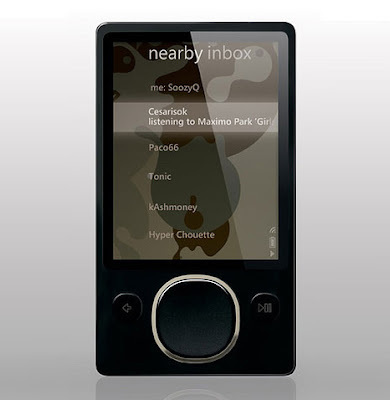 At the end of the webinar one lucky participant will win a 120 GB Zune MP3 player! It could be you. Hope to see some of you on Tuesday. If you have any questions please leave a comment or sent me an e-mail. Thanks.